Winter has officially arrived and we are spending more time indoors, all bundled up. It’s time to shake off those winter blues and get busy! As the colder winter months are upon us, there are some great things we can do to keep moving and keep our homes in tip-top shape. 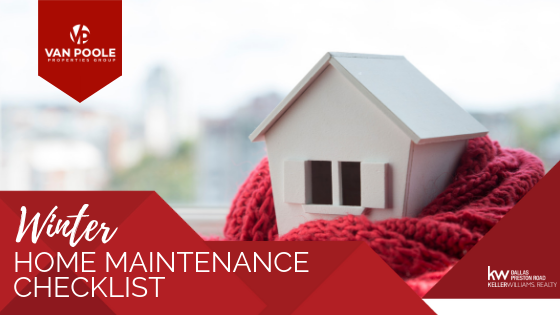 With the help of Realtor.com and Houzz.com, we’ve compiled a list of great home maintenance tips for winter! Tackle the holiday cleanup. It’s time to pack it all away and clean up the chaos. Whether you’re ready to mulch your tree or just clear out and clean, this is the perfect time. Prepare and Prevent. Prepare your pipes for freezing temperatures. If you haven’t already, make sure you are covering outdoor pipes and opening up the cabinets for super cold days to keep your pipes from bursting. Next, test smoke detectors to ensure they are in working order, as those heaters are running more heavily. Refresh and Remove. Clear your play spaces and closets of excess clutter and things you no longer use, including the pantry. Tackle it space by space and pack away items to sell in the spring or schedule a donation pickup. Go green. We are all about recycling, but this form of green is all things plants. Begin thinking of what you want your yard to look like, or start your seedlings for your garden about 6 weeks ahead of spring temperatures. Need some green now? Find indoor plants to add to your rooms and bring fresh air in! Take a look at your linens. Clean out your laundry room and get it reorganized. Donate old towels and linens. And while you’re at it… Clean out your dryer vents than can get clogged, reducing energy efficiency and can cause fires. Make the most of your mattress. Rotate (or flip) your mattress and break out the vacuum to give it a good clean too. Don’t forget the box spring! Refresh and reorganize your indoor entertainment activities. Organize your bookshelves and donate books you no longer want to keep. Give your movie watching area a new look to snuggle in for movie night with new blankets and pillows. Vacuum out the couch and if you have leather, give it a conditioning treatment. Get out your board games and reorganize or donate unwanted games. Pay close attention to moisture in your bathrooms. The lack of fresh air and sealed spaces can be a breeding ground for mold and mildew. Inspect your ceilings and grouts in those rooms and give the space a deep cleaning. Bring in some fresh flowers. Brighten up your space and shake off any winter blues. Thinking of selling your home this spring or summer? Now is the time to start planning if you’re thinking of putting your home on the market. Even if you aren’t in Dallas-Ft. Worth or Austin, give us a call and we can help you figure out which projects to tackle first and how we can help you. Rework your entryways. Bring in a new doormat if yours is looking a little worn, or if you can, give it a good clean. Clean your doors and the frames to your entryways, and if needed, freshen up the paint. Prepare for April showers and storms. Clean out your gutters and check your roof to make sure they are ready for the upcoming downpours. It’s time to get outside and get your yard ready to bloom. Planting a tree is ideal in the spring and fall, so if you’re thinking of this as a new addition for summer relief, now is a great time to add this to your home. Tune up your tools, wash your patio furniture, and prepare for all the upcoming outdoor fun. Give your kitchen a deep clean. Tackle the cleaning in the kitchen that is forgotten about in the day to day. Break out the vacuum for under the fridge and stove, clean the coils on the refrigerator, and give your range hood, backsplash, and lights a thorough wipe down to knock out any grime. Before you know it, spring will be here and we can get back out and enjoy the beautiful weather! Here’s to a happy home.